PennsylvAsia: Erie Asian Festival 2019, May 4. 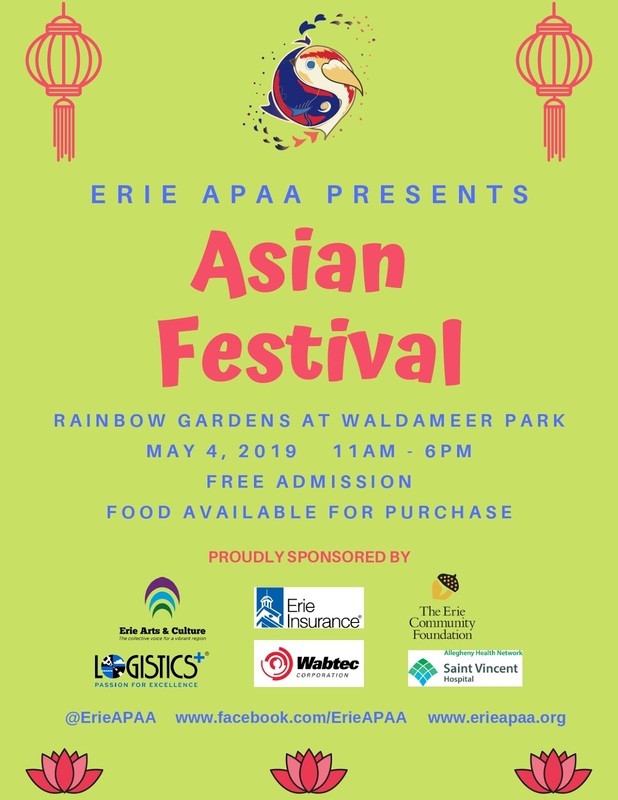 The Erie Asian Pacific American Association is presenting its annual Asian Festival on May 4. On May 4, 2019, the Erie Asian Pacific American Association (Erie APAA) will host the seventh Asian Festival at Rainbow Gardens at Waldameer Park, 11:00am – 6:00pm. Erie APAA has successfully hosted this event biennially since 2007, with attendance growing to 3,000 people at previous festivals. The festival will showcase the diversity of several Asian countries/cultures in our community: Bangladesh, Bhutan, China, India, Japan, Myanmar, Turkey, Pakistan, and the Philippines. There will be display booths, cultural performances, demonstrations, activities and ethnic food. Through this festival, Erie APAA hopes to promote greater understanding and appreciation of the cultural diversity of Asia. Cultural performances by representatives from local ethnic groups will include traditional dances and an ethnic fashion show. There will also be a Tae Kwon Do demonstration. Activities will include henna, Chinese calligraphy, origami, kendo, and the chance to try on various Asian attire. Ethnic food from seven of the participating countries will be catered from regional vendors. The Asian Festival is free and open to the public. Food is available for purchase. Attendees can also stop by the Asian Bazaar to purchase Asian items and souvenirs. To view photos from the previous festival click here. To view videos of past performances click here. Waldameer Park is located at 220 Peninsula Drive (map), at the entrance to Presque Isle in Erie.